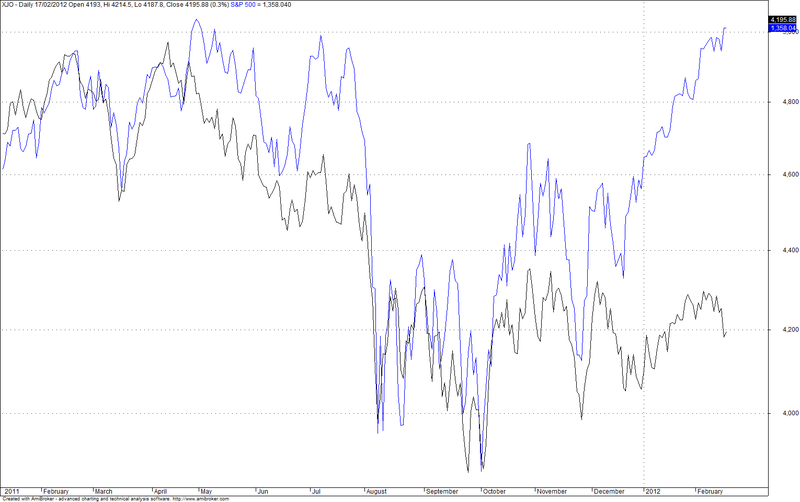 Chart below shows the S&P/ASX 200 (black) relative to the S&P 500 (blue). I’m tipping this underperformance to continue … obviously credit conditions are relatively tight here vs everywhere else which is positively awash with liquidity (add Japan to this list). Our key sectors have little growth – financials sufffering from weak credit growth while resources facing the double whammy of a strong currency and cost pressures. In addition I believe the high AUD makes the market a good relative short. And I suspect long only investors with global mandates do not see buying the market with the Aussie at 1.07 as attractive. So fairly sangiune for now. Would like to be more enthusiastic!